Tires are a very small portion of your vehicle but it is one of the most important if not the most important part of it. Your car may run with a motor, but it will not get you anywhere if you do not have tires. It is the only part of the car that comes in contact with the road so putting the right air pressure is crucial in its performance. The right tire pressure will maximize your car’s performance. This will allow you to experience durability, tire comfort and performance that match the needs of your vehicle. What are the things or the basics of tire pressure that you need to know in order to maximize your tires’ performance? Your vehicle comes with an owner’s manual. The correct tire pressure is indicated there and on the driver’s door panel. Make sure that you read it before inflating the tire yourself. Remember that the recommended tire pressure is for cold-weather inflation. Because gas expands when heated and contracts when cold, the weather will affect the correct tire pressure number. It is advised that if the temperature increases, for every 10 degrees (Fahrenheit) you should also increase your Pounds per Square Inch (PSI) by 1 or vice versa. Whatever the weather condition is, you should always increase the PSI when your vehicle is carrying a heavy load. Your tires would need a higher PSI to support the weight our vehicle is carrying. The PSI will depend on the load, the type of tires and the vehicle. If in doubt, refer to the owner’s manual or get in touch with your trusted tire dealership for the right PSI. 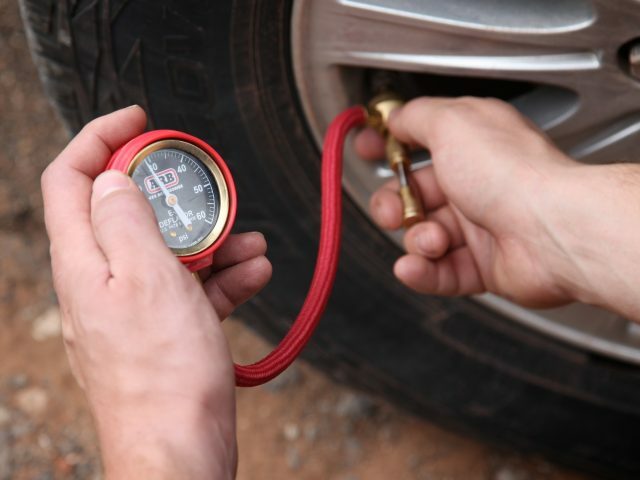 Another basic tip that you should be aware of is the best time to check your tire pressure. In the morning, before your first drive of the day is the best time. It is also important to note that the time of day can affect the tire pressure measurement. If the vehicle has come in contact with hot pavement or parked under direct sunlight, they can affect the PSI reading when inflating your tires. Why you should not over-inflate or under-inflate your tires? We have never stressed enough the importance of filling your tire with the correct pressure. Why do we insist on this? Over-inflating your tires will make them inflexible so road debris and pothole can do damage to them. Under-inflated tires during rainy season will not shed water from your tires which increases the risk of losing control when driving. During winter, under-inflated tires might not provide enough traction that can lead to accidents on icy roads.